Last week I was feeling favorably disposed toward “Civil Youth.” I was really looking forward to being in their music video. They booked me several weeks in advance. I skipped submitting for other gigs. I packed up for the trip to Philadelphia. I arranged for pet care. I stored stopped the mail and newspaper. I drove to Metropark and parked my car there and took a train in. But, just as I was parking, I got word that the video was cancelled. Now I’m feeling less favorably disposed. I’m an attorney. I could possibly sue them, based on having relied on their booking me – because I skipped submitting for other gigs for the days I was booked for. I studied contract law. I remember that “reliance” was a basis for recovery. Am I going to sue them? Unlikely. The video was supposed to shoot in Langhorne, PA. That would mean I would likely have to drive down there and make a claim in small claims court. The amount that I could recover in salary would probably not cover the cost of the trip. There is also the loss of exposure, which would be hard to value, especially because I can’t prove for sure I would have booked the alternative gigs even if I had applied for them. And people wonder why so many actors become socialists. Actors are routinely abused in employment. I've been repeatedly exposed to dangerous air quality issues on set: particulates (plastic dust, spray on makeup). In one short, I was paid nothing, because I was non union, while union background were paid. I've endured inadequate restroom facilities. I've frequently been paid under minimum wage. Non union jobs often don't pay for rehearsal time. No one seems to pay for time spent at home memorizing lines. It's considered acceptable to abuse actors, because actors are so eager to get any gig. They’ll do almost anything, even if it’s dangerous. One of my friends fell downstairs doing a dangerous shoot and was seriously injured. She even told the director she thought it was dangerous, but he told her to go ahead and she did. In retrospect, she shouldn’t have, but she didn’t realize the magnitude of the injuries she was about to suffer. When I complained about the plastic dust on set in “Book of Henry,” they did not take me seriously because I am not in the union. I tried complaining to the government, but the OSHA people told me that my employer was Central Casting, so they would have to go against Central Casting, not against the movie producer who exposed me to plastic dust. I didn’t want to go against Central Casting. I didn’t really consider it their fault. Moreover, I wanted to book more gigs with them. The union is hard to get into. You have to book 3 union gigs to get in. Apparently, they don’t help other actors. This really isn’t very good politics on their part. If other actors are getting hired because productions can get away with abusing them, that hurts union members, who presumably will be avoided. There is here a more general issue with workers who work by the day on projects that only exist for a short time. There’s really no one to go after, even if you were to sue. Particularly, in the case of film projects, the boss is likely to be an ordinary person making only that one film, with no resources. We may not even have an address for them or their real name. We are also often independent contractors. Generally, agencies that the government has in place to protect employees don’t protect self-employed independent contractors. If they are workers, working in home improvement, they can at least put a lien on real property to secure payment. If I get lung cancer in a few years from the plastic dust on the set of Book of Henry, or the spray makeup from Bite School, it’s going to be hard to prove that those things caused my problem. I feel that there is a gap here in government protection. Actors are particularly vulnerable, because the business environment is so fragile and competitive. Another thing that is missing is a union that any actor can join, even if they don’t have union experience – a union that wants to protect all actors – not create barriers to employment. Of course, some shows make you sign a contract agreeing that you’re non-union and that the production is non-union. I’m not an expert in labor law, but I wonder whether these contract clauses that basically say that the actor can’t be in a union are even legal. I feel that this blog is not completely edited and thought out. I need to get better organized conclusions – and possibly a better organized introduction. I want to create some kind of manifesto about the need to protect actors. Cities like New York and Los Angeles, which have a lot of actors, should be particularly interested, as these actors are a substantial fraction of their people. I saw that actors were on strike in Los Angeles demanding that actors be paid minimum wage – that these tiny stipends that don’t even cover expenses should be illegal. Possibly they are already illegal – but in this atmosphere of actors being so desperate for any kind of work – who would sue? 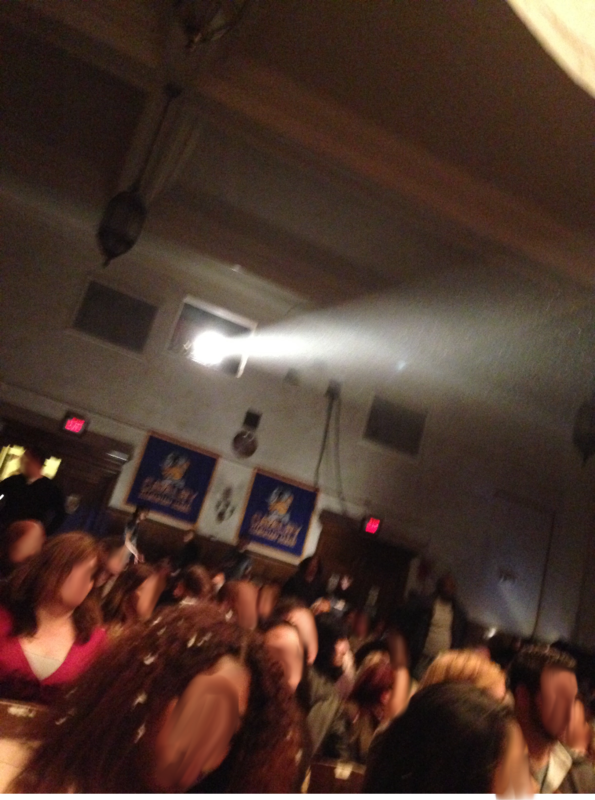 The spotlight from this projector shows how thick the fractured plastic snowflake dust was in the air on set. The director told us that these plastic snowflakes were approved by SAG, but I doubt that that approval foresaw sitting there for 3 hours with no break having the snow released over and over -- and having the snow fracturing into tiny particles. The flakes themselves were too large to inhale, but the dust was not. I've smeared the faces of others on set, who haven't given permission for their likenesses to be used. This is a photo of my glasses, showing how much dust was on them when I left the set. Obviously, I was also inhaling that stuff. There was no warning that there would be particulates on set. I'm a cancer survivor. There's no way I would have subjected myself to inhaling plastic dust, if I had had prior warning. The new election shall be a direct election, without use of the electoral college. If no candidate receives a majority in the new election, then there shall be a runoff election between the two leading candidates two weeks afterwards. A new election under this provision may be ordered no more than once per calendar year.